Double Drop A & B Train. Axle Spread: 9′ 8″ Good for 43,500 lbs. • MAIN FRAME AND TONGUE: formed I-beams made from high yield structural steel. • 3/16” & 1/4 ” formed channels. • KING PIN: 2” X 3/8” bolster on 1/4” 5th wheel plate. • LANDING GEAR: Holland 2 speed. • SUSPENSION: Hutch spring suspension, Ridewell Ridelite air ride optional. • DROP AXLE: Ridewell 232 HMT optional. 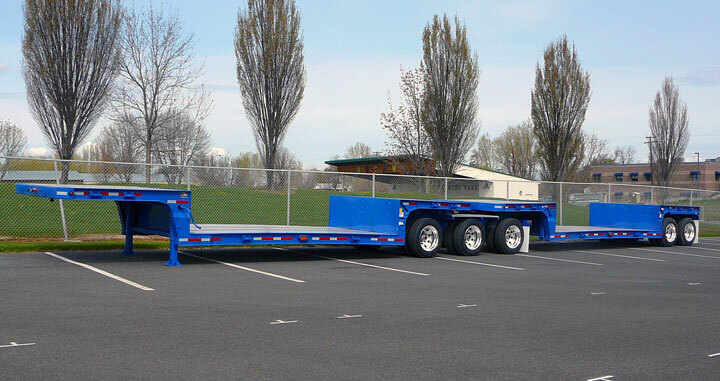 • AXLES: 77.5” or 71.5” Track, 1/2″ or 5/8” wall, steel hub pilot hubs, cast drums, ”Q” series 16.5” X 7” brake shoes, 30-30 spring brake chambers, auto slack adjusters. • WHEELS: 22.5 X 8.25 steel powder coated, Aluminum optional. • TIRES: 255/70R22.5, 295/75R22.5, 385/65R22.5, 445/50R22.5. • BRAKE SYSTEM: Meritor/WABCO 2S2M premium ABS system. • ELECTRICAL: JKD 7 wire sealed harness, sealed ABS wire harness. • LIGHTS: 4” JKD LED tail lights, 2” JKD led beehive maker lights, mid trailer oval turn signal, DOT approved 1 1/2” & 2” conspicuity tape. • METAL PREP: sand blast. • PRIMER: PPG 2 Part epoxy 400,401. • PAINT: polyurethane top coat black in color, other colors optional. • MUD FLAPS: DIONBILT 30”.